OMG Posters! » Archive The Universal Classic Monsters Print Portfolio by Tom Whalen (Lottery Info) - OMG Posters! 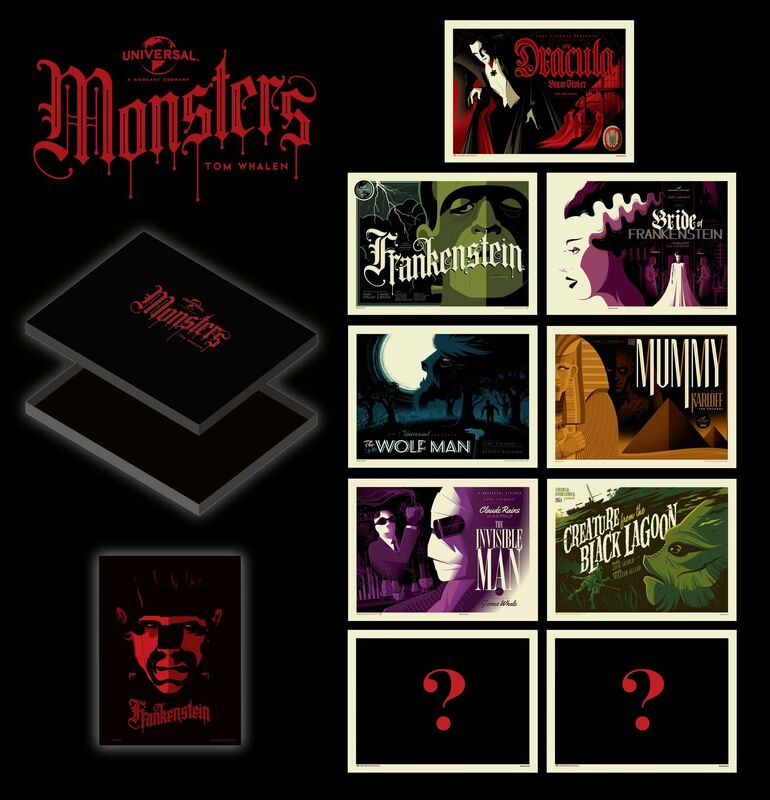 Dark Hall Mansion is currently holding a lottery for the right to purchase their new Universal Classic Monsters portfolio by Tom Whalen. The set includes ten 18″ x 24″ screenprints (a diptych has not yet been revealed), has an edition of 230, and will cost $350 shipped. There is also a silver screen variant with an edition of 70 for $450 shipped. The lottery info is below. Enjoy! You have from NOW until next Tuesday afternoon at 5 PM PST to e-mail us at: info@darkhallmansion.com with the words “WHALEN STANDARD” OR “WHALEN VARIANT” in the subject line for a chance to win your right to purchase either ONE “Universal Classic Monsters” 10-Print Standard Edition Folio or ONE “Universal Classic Monsters” 10-Print Variant Edition Folio. We will take all of the e-mails that we have received by 5 PM PST Tuesday afternoon (Note: day BEFORE the release), hold a lotto, and at 9 AM PST on October 30th we will e-mail the winners of the Standard and Variant Editions with separate e-mails sent for each edition. For those attempting to purchase both editions, and lucky enough to win both lottos, you will receive two separate e-mails confirming that you have won. ONCE THE E-MAILS ARE SENT AT 9 AM PST ON OCTOBER 30TH, THE WINNERS WILL HAVE THREE HOURS IN WHICH TO PAY FOR THEIR SETS VIA PAYPAL TO info@darkhallmansion.com.